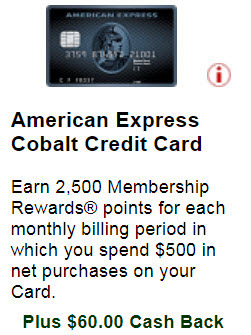 AmEx Cobalt Card is one of the best credit cards in Canada. Now, you can earn 2,500 Membership Rewards points for each monthly billing period in which you spend $500 in purchases on your Card. This could add up to 30,000 points in a year. Plus you can also earn $60 cash back rebate from GCR, if you apply this card through GCR before Apr 30, 2019 (the annual fee is $120. So, it is similar to half annual fee rebate with GCR bonus).